By Amy Grehan | February 13, 2013. Regeneration projects have been proposed for many different areas in Dublin City, however, put forward last year, the regeneration of Thomas Street has still not begun, reports The Liberty’s Amy Grehan. 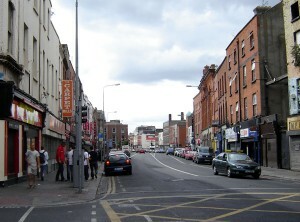 Regeneration proposals for Thomas Street in Dublin’s Liberties were put forward by Dublin Civic Trust in May 2012, however seven months on no progress has been made. The study, commissioned by Dublin City Council, entitled “Thomas Street – Improving the Public Face of an Historic City Centre Street”, put forward a vision for the future of the historic thoroughfare in Dublin 8, which has suffered from urban blight, dereliction and vacancy. The study highlights Thomas Street’s historic buildings as one of its principal assets, while underlining the importance of its restoration as part of a drive to improve the appearance of the street and its architectural character. Thomas St is the commercial heart of The Liberties, as well as being home to the Guinness brewery and storehouse, it’s home to buildings such as the church of Saint Augustine and St John the Baptist, Kilmainham Jail, the National College of Art and Design and the Digital Hub. 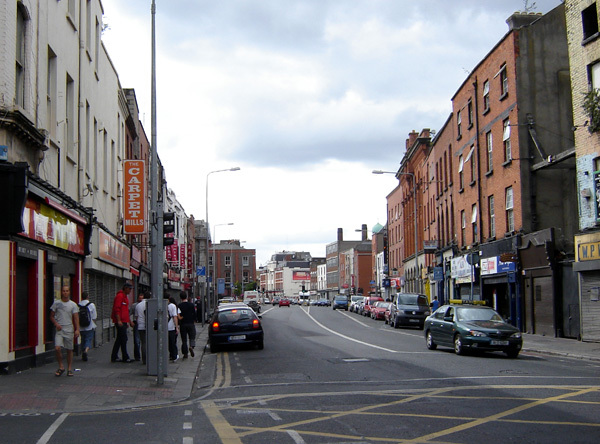 The origins of Thomas St can be traced back to the Medieval times, but from the middle of the 20th century it began to decline. Today, there are a huge amount of derelict buildings, many of which are protected. Behind the gaudy shop fronts, plastic signage and rendered brickwork are buildings which once played a big role in the development of Dublin as a bustling city. The report had three strategic aims: the physical quality of the street, cultural life and tourism, and retail activity and the Market St. The plan said that the economic value of the architectural heritage must be clearly articulated to property owners and businesses on the street, and that there should be a number of things put in place to do this. It emphasised the need for improved presentation of facades and says the council should seek the appropriate infill of damaged sections of streetscape and actively promote refurbishment and renewal of historic buildings. It also encouraged the restoration of historic buildings, such as the Cash Converters building and 20 and 21 Thomas St, which are two formerly gable-fronted ‘Dutch Billy’ buildings dating back to 1700’s. It suggested building high quality residential apartments, while the Vicar St terrace should be rebuilt. The report said the council should promote high quality shop fronts and emphasises the need to improve the quality of paving, street lighting and street furniture. The importance of tourism to the area means that tourism structures should be developed, including the creation of a new visitor attraction and a tourist trail. It also suggested restoring the Iveagh markets and engaging the NCAD and other stakeholders to create a retail ‘vibe’ for the street. It envisioned a Thomas St of 2020, where restored facades of historic buildings along with sensitive infill would create a “an attractive backdrop to this bustling shopping street with its historic churches and lively cafés, bars and restaurants”. However, more than a year and a half later, no effort has been made to follow through with plans to preserve and restore the historical buildings. Chief Executive Officer of Dublin Civic Trust, Geraldine Walsh said: “There are now limited funds to implement initiatives of this kind.” The trust said it realises funds are limited and it recommends the establishment of a facade restoration fund of €100,000 as a joint venture between the National Lottery, Fáilte Ireland and the city council. A small level of investment from businesses on the street could also realise a major benefit to the street and the businesses, it said. I caught up with Trinity College student Keith Hennessy who is living on Thomas St, to ask him how he feels the area should be improved. “If I was on the committee for change I’d like to see an increased effort in street cleaning in the area as it’s always filthy. Dublin 8 is probably the city’s main artistic hub at the moment so I would like to see greater provision of space for performance, such as theatres, and licenses granted for more bars and cafes, especially at the upper end of Thomas St. A 24 hour store wouldn’t go amiss on the street either, as after 10pm your only option is to walk to the spar on the quays or as far as Dame St.